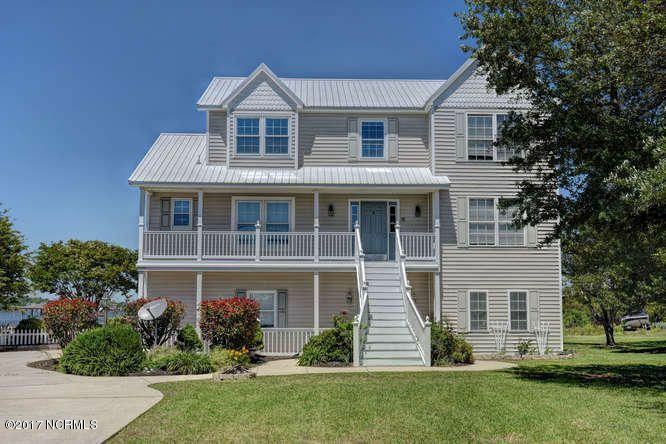 Relax at the end of the day on the upper back porch and watch the sunset over Chadwick Bay or entertain friends and family in the huge kitchen featuring tons of cabinets, granite counters, kitchen work island and stainless steel appliances. Wood floors throughout the living space accentuate the 2750sf open floorplan offering roomy great room and fireplace making a cozy haven or sit out in the sunroom and stare at the views. 4 bedrooms up with master offering wainscoting, dual vanities, separate shower and soaking tub. Full 600 sf downstairs apartment with living space, kitchen and bedroom not counted in square footage. Relax around the Inground pool with mature landscaping, a perfect coastal oasis. When not sitting around the pool walk out on your shared dock for a little fishing or boating. Watch the egrets fish and osprey’s soar and from the back deck or Crab, Shrimp or Fish from your own back yard. If this isn”t Paradise, what is?